You can make a lot of money in the options market. Every day, people make millions of dollars in profit from options. Even people with full-time jobs, like nurses, teachers, and plumbers, can make thousands of dollars in extra income from the options market. But to make the surest, safest, money in options, you have to use options in a totally different way than most people use them. Today I’m going to share a little-known way to pocket a lot of extra income with options. I first learned about it in the 1980s when I was working at Goldman Sachs, the top investment bank. [ad#Google Adsense 336×280-IA]Even better, I’m going to show you a “one-click” investment you can make today that allows you to profit from this strategy. And if you’re an investor looking for high-income and low volatility, you’ll want to know this strategy. Before I go any further, let me point out that today’s idea does not require you to trade options. But it does give investors the benefits of a time-tested options strategy – reduced risk, lower volatility – without any of the hassle. To start, remember… options are simply contracts that allow two parties to buy or sell an asset at an agreed-upon price by a specific date in the future. Stock options – known as “puts” and “calls” – allow investors to make targeted bets on stocks. A stock trader can only bet whether a stock will rise or fall. But an option trader can make almost any bet imaginable. If you know how… you can bet a stock will stay the same price. You can bet a stock will rise, but only to a certain level. You can bet that a stock will rise until a certain date and then fall. Options can turn risky stocks into safe bets, or safe stocks into risky gambles. Options can also be used as leverage to increase your risk and returns. Or they can be used to do the opposite – lower your risks. In other words, options allow investors to custom-tailor their levels of risk and reward to fit their needs and goals. You simply buy stocks and SELL call options against those stocks. Regular readers may recognize that we have used covered calls to great success in my Retirement Trader service. (In Retirement Trader, we call them “IRA Alternatives.”) We have closed 98 out of the last 99 IRA Alternative positions for a gain, booking an average annualized profit of 26.6%. But actively trading options isn’t for everyone. Instead, with the click of a few buttons, you can buy what’s called a “buy-write” fund. The fund essentially performs all the trading for you. The covered-call strategy takes the stock market’s return and smooths out its volatility. Professional investors would say the PBP fund has a “beta” of 0.54. That simply means if the S&P 500 drops 1%, we’d only expect PBP to drop 0.54%. Since the fund makes income from selling call options, it returns a much higher dividend yield of 5% (compared with 2% on the S&P 500 itself). And remember, the strategy isn’t some sort of black-box secret. We’re not banking on the skills of any investment managers. Funds like PBP are set up to track the performance of the CBOE S&P 500 Buy-Write Index. The index was developed by the Chicago Board Option Exchange with Standard & Poor’s and Professor Robert Whaley to measure the returns of a simple covered-call strategy. You can read the exact methodology at cboe.com. In fact, if you were so inclined, you could fully enact this strategy on your own. The information is entirely public. According to a study by the investment consulting firm Callan Associates, the buy-write strategy produced superior risk-adjusted returns for 18 years, earning about the same as the S&P 500 with one-third less risk. Also keep in mind, this strategy works over the long term. There will be times when it does better or worse than the market. In particular, it tends to underperform the S&P 500 during rising stock markets. But it makes up for that by consistently outperforming the market during falling periods. That makes now the ideal time to invest. While I still think the market is bound to keep rising in the near future, we’re closer to the end of the rally than the beginning. Every day the market ticks higher, we need to think more about getting cautious. 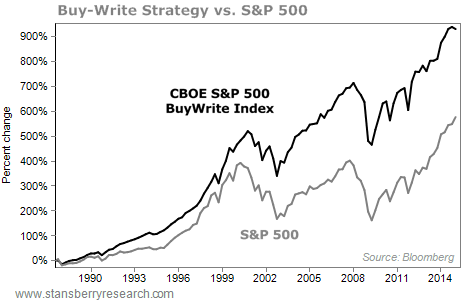 A buy-write strategy allows us to stay invested and benefit from the rising economy and stock market, while securing some protection against whatever may come. And funds like PBP are the easiest way to implement it. Combine that safety with higher income and, for most investors, that sort of arrangement makes good sense.